Secret Garden: A Bit of Color! It’s only a quick glance today! Next week, I promise we’ll chat a bit more about the flowers on the Secret Garden embroidery project. We’ll look at colors and techniques, and I’ll give you some stitching tips. But in the meantime, I just wanted to show you a splash of color on the linen, so you can get a sense of where the piece is going. Green, you see, is not the Only Color! You can click on the photo above for a larger image. The Best Thing about the flowers? The stitch up relatively quickly – much faster than the larger long & short stitch leaves that we plugged through earlier! The exception is the two larger (of the eight) flowers on the piece. They take a little more time, because they are significantly larger than the rest of the flowers. I’m keeping the stitches on the flowers relatively simple – padded satin stitch, seed stitch, buttonhole, French knots. With the stitches comes a bit of contrast and texture, too, which is always good. More next week! I hope you have a terrific weekend, and that you can spend at least a wee bit of time over the weekend with your needle and thread! Ooo, I like those flowers! I can’t wait to see more of them! And those colours are very pretty. Hope you have a nice weekend, too. They look gorgeous Mary and thanks so much for providing the option of a larger image – allows to see all those details beautifully! Beautiful! I love your color choices, and I can’t wait to see what you do with the hummingbirds! Mary, your work is so breathtaking — I’m in awe of your skill. I would like to try something similar someday, but I’m a non-artist. I have no idea how to blend colours to get the beautiful shading and progressions of colour that you do. By any chance, do you know of a book or a site that would give me some pointers on how to do this? Preferably an embroidery book, but even a book for artists would probably help. Thanks in advance. You might try Trish Burr’s book on color in embroidery. 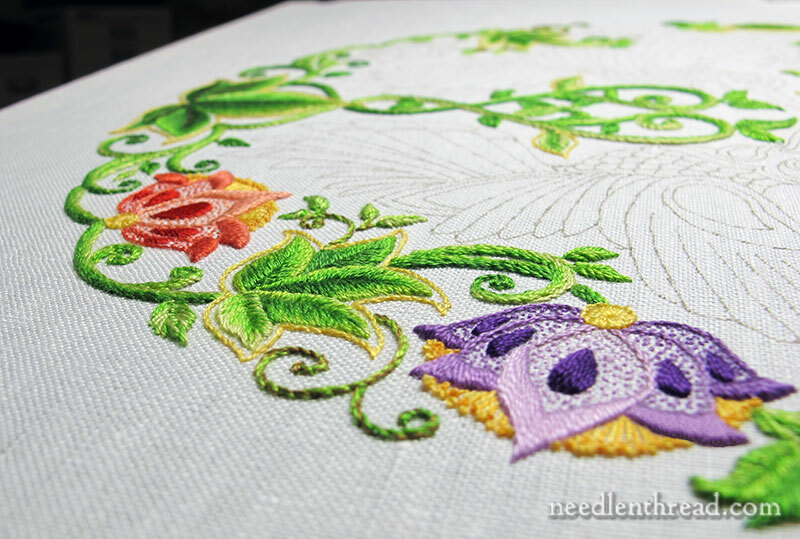 Here’s my review of it: https://www.needlenthread.com/2011/12/colour-confidence-in-embroidery-book-review.html It concentrates on needle painting, but she provides many many color schemes and talks about choosing colors – it works for any type of embroidery, really. Mary, you are so talented. Have you ever thought of starting a school for embroiderers? You have so much to offer us. Oh, WOW! It’s beautiful and I love the colors! What beautiful colors for the flowers Mary. Love how your project is progressing! From what I can see at the angle of the photo it’s gorgeous! I will admit to a little reservation on the Seed Stitch, only because I usually loath gaps of white. I’m also pleasantly surprised by the combination of cool purples with hot corals. Normally, that’s something I’d avoid but you made it work well. Can’t wait for more in-depth pictures and discussion. I’m even more curious as to what you have in-store for our feathered friends. You’ve surprised and delighted me already with your colour choices! It’s even more gorgeous than I’d imagined. My Secret Garden book arrived a few days ago! I’ve flipped through it a hundred times already, as well as taking it to the local quilt shop where we sat and looked through it there. I had SUCH a hard time picking only one picture to start with! I decided that I’m going to do the gazebo page as an embroidery project with some of my own flowers added plus flowers from a different embroidery book. Colours I wouldn’t be confident to use together but is so good to see them like this done by someone I know knows what goes. (I think that makes sense?!) I can see now, the idea of that green once the other colours have been added. How beautifully springy it is. Nice for us who are starting an early winter in parts of down under. I like the contrast of the seeding for both the flowers and the full cover green. It was the first thing I noticed. Love the colors and what appears to be different textures. Can’t wait to see more! This is just stunning Mary . I am in awe of your work. Well the flowers are lovely and I love your choice of stitches, it looks so vibrant and simple and really matches the green leaves. I can’t wait to see more progress on this project. I’m dog sitting at the moment for my sister so I’m not able to do much embroidery as the dog (she’s so lovely) keeps me busy, back to normal on Tuesday. Really very, very beautiful. Thanks for x2 larger image.I find it is good idée ,point de sable and I love plumetis padded.Colours ? You are the best!. Looking so beautiful! I especially love this project because I love my garden and the hummingbirds that visit. To me the flowers look a lot like my cactus blooms that the hummingbirds love in early Spring! Previous Previous post: Guide to Hedebo Embroidery – A Give-Away!